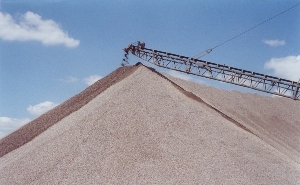 Gravel extraction first began at our Brock Road site in the early 1960’s. 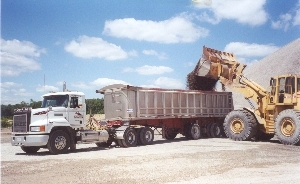 Initially, removing the gravel from the ground was a fairly straightforward process and was accomplished using bulldozers and front-end loaders. Over the years as we continued to excavate further into the ground, extraction became more difficult. Eventually, as we approached the water table, ground water became an obstacle as a man-made lake began to form. 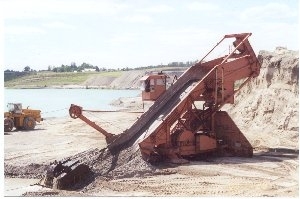 In order to continue to access the rich gravel deposits that existed on the property, it was necessary to use more advanced extraction techniques. 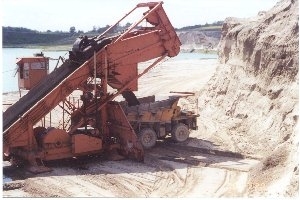 Pictured here is a German manufactured KS-1000 Drag-Scraper. This machine allows us to extract material from the lakebed to a depth of 65 feet. 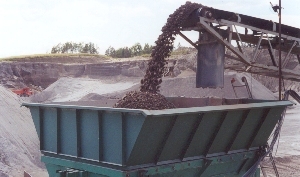 At this point, the extracted material consists of a combination of sand, rounded rocks and boulders. 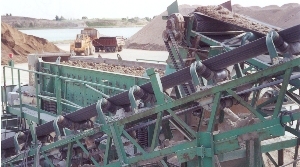 To transform this material into saleable aggregate products, a process of crushing and screening is required. 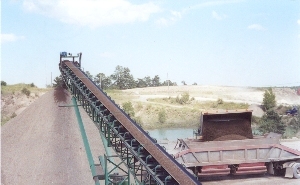 The extracted material is fed into the crushing plant through a series of conveyers. 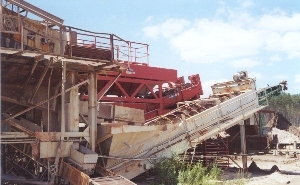 Depending on the set-up, the crushing plant can produce material that is ready to be sold (such as Granular A) or material that will be processed further before it is ready for sale. 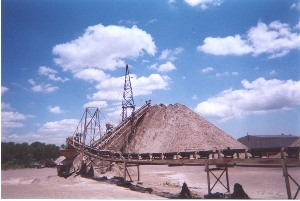 In this picture, the output of the crushing plant (a mixture of sand and crushed stone) is stockpiled and than transported to the washing plant for further processing. 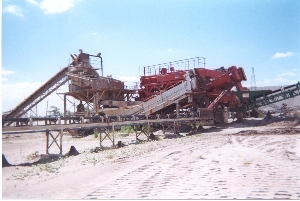 At the washing plant the crushed material is washed to reduce the dirt content of the aggregate. As the material is washed, it travels through a series of screens in order to separate the sand and stone components. The stone component is sorted into various sizes (1/4”, 3/8”, and 3/4”), and the stone products are stockpiled to await shipment to the customer.